Ever since I posted about National S’More Day, I’ve had S’Mores on the brain. I have all these crazy ideas running around in my head, and finally I just have to stop, bake and share them with you. Two of my very favorites…combined together…Caramel Apples and S’Mores! Oh my!! I think I should have paid more attention when Missy over at How Does She blog, gave us her tips for the perfect marshmallow roasting. Some of the marshmallows turned a little too brown, but they were still really yummy! 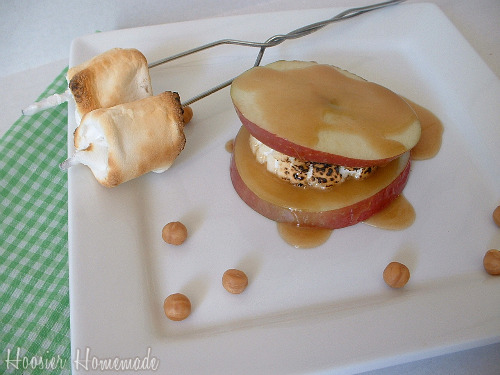 A fun new twist on caramel apples and s'mores - Caramel Apple S'Mores at HoosierHomemade.com. Combine all ingredients, except vanilla, in a saucepan on the stove. Whisk ingredients together and cook until thickened, about 5-7 minutes. Add vanilla, and cook another minute to thicken more. Remove from stove and pour into container. Slice 2 pieces of apple about 1/4 – 1/2 inch thick, for each S’More. 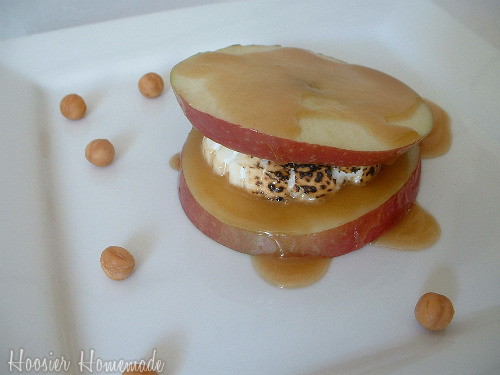 Place 1 piece of apple on plate, pour a little Caramel Sauce over, top with roasted marshmallow, add second piece of apple, pour more sauce over top. The Caramel Sauce was very easy and tasted really good. But if you don’t want to make your own, you can certainly use Caramel Sauce from a jar (like for Ice Cream topping), melt some of the Caramel bits, like I have on the plate or even buy the tubs of Caramel that most stores have next to the apples. Anyway you make them…I’m sure they will be a hit! For “S’More” yummy recipes…check out this little book, all about S’Mores!! You had me at caramel apple. Then you added marshmallow and I just fell over. YUM!!! Fun twist on a classic treat! How clever. This looks so tempting and delicious. I love the combination of flavors, why not?! Your photos are great. Yum, I need one now and it’s almost midnight! I am so bad on FF I head straight to all of the treats!!! What a neat fall recipe! Now I’m totally wishing I had some apples and caramel! I have never seen somthing like this… ever. It is a masterpiece of fall flavors. I think this will be a StoneGable new favorite! I’m SO impressed by your creativity! I think you are trying to sabotage my desire to lose weight! LOL This looks like something we definitely need to try out. Wow what a great recipe! I will have to try them. I am sure my kids will eat them right up! Oh I am going to definitely do this for my daughter. She is allergic to chocolate so she often misses out on the smores but this is perfect for her! I might even sandwhich it between graham crackers for her so it’ a little less messy since I know she will want to pick it up like everyone else does with regular smores! I am so going to try this! Thanks for the idea, that looks delicious.